Over the next few weeks, kids of all ages will jump (or roll) out of bed, prepared (or not) for the first day of school. With this annual event comes a wide range of emotions. Whether it’s the fear of forgetting a locker combination or a general apprehension about the new curriculum, this time of year can be challenging for many. Thankfully, many of these back to school fears subside during the first few weeks as teachers work to develop a safe classroom culture (physical and emotional.) The daily routine eventually becomes part of a new normal and before long the early fears and worries are nothing but a distant memory. It’s during this new normal (or routine) that mindset becomes more important than ever. While the early fears may be absent, they are often replaced with a brand new set of emotions, including boredom, frustration, or discontent. These new emotions, left unmanaged, often lead to a lack of engagement or occasions of kids simply checking out. Here’s where the power of mindset comes in. While students often point the finger of disengagement in the direction of someone or something else (i.e. teacher or homework), a shift in mindset ultimately places responsibility in the hands (or minds) of students. This is the essence of personal responsibility. Below are 3 of the most common student mindsets that lead to disengagement. In addition, I’ve provided a new mindset that will likely lead to more engagement. Disengaging Mindset #1 – My teacher is so boring. If I had a nickel for every time I heard a student utter these words, I’d be a rich man. Whether it’s a monotone delivery or a lack of positive energy, kids will often find evidence to prove that the boredom is real. I truly believe that boredom is a function of the mind. In other words, you can’t find boredom out there. What may be boring to one may be interesting to another. Having said this, I invite kids to shift their mindset away from what the teacher is saying or doing and focus more on what the learner is saying or doing. At a fundamental level, the teacher is simply teaching. A student’s job is not to change the teacher, but to take responsibility for the learning. 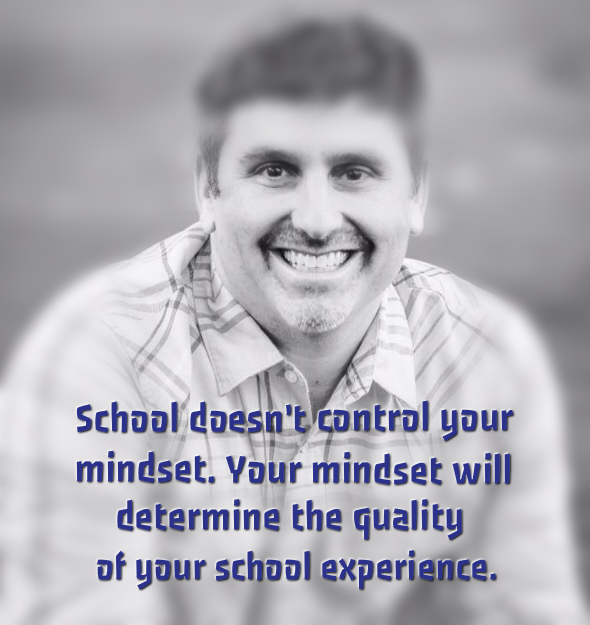 Engaging Mindset #1– I’m taking full responsibility for the learner (me). Disengaging Mindset #2 – I’ll never be as smart as them, so why even try. Unfortunately, the almighty letter grade continues to be the primary means of identifying smart students. Although teachers don’t often advertise grades for other kids to see, kids have a way of finding out. It’s a well-known belief, albeit distorted, that those who are scoring the highest are the smartest. Therefore, if a student is consistently scoring B’s or C’s, it’s natural for them to throw in the towel mentally. In their eyes, if they can’t achieve the grades the smart kids are receiving, why even try. Thankfully, there’s another kind of smart that is rarely talked about in classrooms. Unlike school smarts, which is based solely on content knowledge, self-smarts has everything to do with self-knowledge. In other words, it’s not just about how much core content I know, but more importantly, it’s about my knowledge of the way I think, the way I feel, and the choices I make. Not surprisingly, when a student works on his/her self-smarts, school smarts naturally improves. Engaging Mindset #2 – If I work on myself (self-smarts), I can identify what’s stopping me from achieving greater academic success. Disengaging Mindset #3 – Homework is a joke. Why do I have to do this? Truth be told, I’m not a big fan of homework. Having said this, I recognize that it’s still a reality in most schools throughout the country. Essentially, students have two choices with regard to homework – to fight it by complaining or to accept it as a reality. When they fight it, it often leads to less than desirable work or even a refusal to do the work. Sound familiar? I mentioned earlier that teachers are simply teaching. Well, homework is simply homeworking. Simply put, the homework itself has absolutely no power to change the mood of a student. It’s just a stack of papers to complete or a book to read. The papers or book could care less about a student’s feelings. Fighting homework only drains mental strength. Engaging Mindset #3 – I choose to accept homework for what it is. Instead of calling it homework, I’ll call it brain training.